Slightly off topic, but is anyone else finding the FV3 strat charts a little hard on the eyes? Because they're shown in higher resolution than the operational GFS charts, they (in my view unnecessarily) "spam" the temperature number of each gradient multiple times, leading to little marked numbers littered all over the chart as opposed to just once per isotherm as in the current operational GFS. Coupled with the higher resolution causing each temperature gradient to have a much more jagged isotherm separating it from the next, and the chart becomes, in my view, a lot messier to read than the current operational. I'd argue that the trade-off isn't great - we're not getting that much useful extra info in exchange for charts which are messier than the old ones. I'm sure we'll get used to it, I just wonder is this perhaps one of the few downsides to resolution upgrades? Or am I the only one who finds it irritating? Interest in the stratosphere continues to grow. It does seem a bit unnecessary to have this much numbers on the screen rather than just one to show the isotherm, I have never looked at the strat charts on the GFS parallel until now that you've shown this. The GFS has backtracked a touch on runs today with this strat warming in the second week of December looking like a minor warming at most. There was even one run where the minor warming was near non-existent just revealing the uselessness of the models right now even for the stratosphere which I thought would be at least semi-reliable. They beg to differ. Cannot show charts right now. GFS 0z is *very* minor with this warming whilst 06z is a bit stronger with the warming as it normally is. No sign of a SSW on the GFS. Again on the GFS 12z looks all standard fare. "Just a massive ball of blue out over the North Pacific. this represents a strong vortex to spin down across the North Pacific in the coming weeks, driving an extension of the North Pacific Jet. Aligns well with the poleward surge of westerly momentum." According to the knowledgeable ones over on Netweather this is often a precursor to a strat warming event. When you say knowledgeable do you nean Tamara ect? I like her way if looking at seemingly obscure titbits that make a lot of sense when looked at together. Good discussion from the Met Office earlier today. So I've put an X where we should see warming take place as the time line projects forward . Be good to see a similar or more dramatic warming like what happened end of February this year (Circled) to give us the Beast from the East. 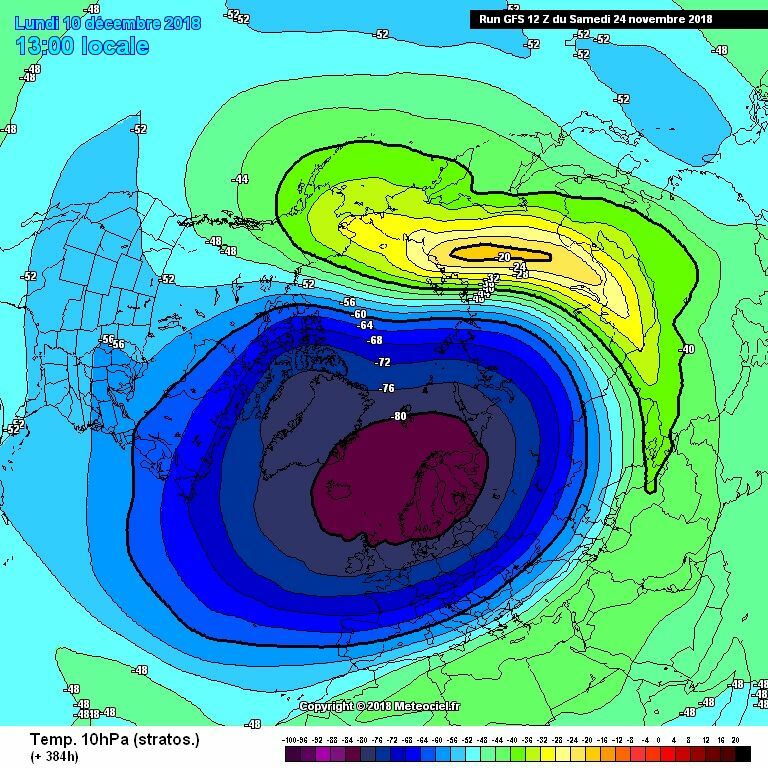 It's looking good at the moment and if we do indeed see enough warming that spits or severely disrupts the Stratospheric Polar Vortex then eventual tropospheric evolution could be a very wintry one. Last edited by BLIZZARD7; 07-12-2018 at 08:40.